Anyone who follows this blog knows how much of a fan I am of footwear. To me, there is no piece of gear more important for day-to-day hiking purposes. When my feet are comfortable I can walk forever, regardless of other conditions. This was a great year for me, as the Salomon XA Pro 3D saw me cover countless miles in multiple countries, the Inov-8 Trailroc 255 helped me fly around the San Gabriels, and although the tread fell apart, the La Sportiva Ultra Raptor dug in to every terrain I threw at it. 2015 looks to be an exciting year for new offerings. I plan to stick with the Salomon XA Pro 3D for the foreseeable future, but there are a few new models coming in 2015 that have caught my eye. Here is a list of my top 5! Also, check out my updated list for 5 More Exciting Lightweight Hiking Shoes here! For those of you who aren’t familiar with the name, Kilian Jornet, he has set multiple speed records in ultramarathons and summit attempts. He is the king of the FKT. For his ascent record of Alaska’s Denali, he needed a lightweight boot that could handle everything…and Salomon delivered. The Salomon X Alp Carbon is a crampon compatible GTX hiking/backpacking shoe that is lightweight, yet fully rigid, thanks in part to Salomons ingenious shank. The zip-up booty design is similar to that employed on the Salomon Snowcross, but looks a little beefier. I’m looking forward to using these on terrain far less challenging than Killian, but I think they’ll still fill an important roll in my shoe rotation. I hate wearing boots, their weight and size have always been a annoyance for me. Yet, there is terrain where they are mandatory. I’m hoping the X Alp Carbon will fill the void left where trail runners are too light, and mountaineering boots are too extreme. Salewa is a company that makes a lot of great gear. The problem is, it’s not readily accessible in the United States. That’s been starting to change in the last few years, as their approach shoes (Wildfire and Firetail) have grown in popularity. They also have a few pairs of boots available on REI’s online store. 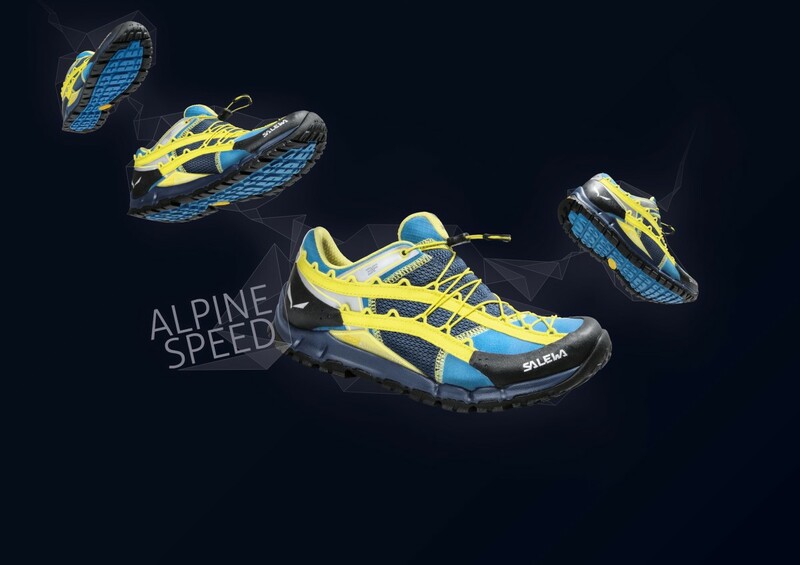 This year, the Salewa Speed Ascent won an Outdoor Industry award for it’s innovation. I’m most excited to try this shoe for very fast days, with a minimal pack, on dry flat trails. The shoes looks light and sturdy, with a rockered profile, something I’ve come to enjoy with trail running shoes. I’m also very interested in customizing the speed lacing that seems to have an infinite number of possible configurations. Depending on it’s durability, this could be a really solid thru hiking shoe, and one I may consider for John Muir Trail. From what I understand, Dynafit and Salewa are the same company, or Salewa is a wholly owned subsidiary of Dynafit. Well, much like Salewa, shoes from Dynafit have been pretty hard to come by in the US, but luckily that’s starting to change. The Pantera looks like a solid fastpacking shoe that is made to go the distance. The overlays may be a little worrisome in warmer weather, but these shoes look like they can handle the toughest of mountain conditions. Another feature that really sticks out to me is the BOA lacing closure system. I love the Salomon quicklace system, and have come to really dislike traditional laces. BOA lacing kicks it up a notch, and everything I’ve seen about them leads me to believe more and more manufactures will be adopting them soon. Okay, so the Cascadia is the most popular trail shoe on the PCT, and probably won’t jump out as “exciting”. The fact that the shoe hasn’t changed radically over the years is a welcome comfort to all those who love it. This year, Brooks has added a new overlay material for the toe box and a slightly redesigned lug pattern for the outsole. There isn’t much else to say about the Cascadia that hasn’t already been said. I expect to see this shoe on the majority of fastpackers on the PCT again this year. Last year I tried on a pair of the NB Leadville MT1210s, the shoe felt great under foot, and was one I was seeing increasingly on the trails. The problem for me was that the shoe felt really hot with too thick of an upper. This was especially noticeable in the heel collar which felt like a skate shoe. I just couldn’t get my foot to sit comfortably, and walking around the store, my heel bobbed up and out. It looks like New Balance has made a lot of small corrections for the MT1210 V2, starting with the upper. The upper looks noticeable thinner, with less overlays and a more breathable looking material used. The tongue looks a little longer, which is nice as I found the tongue on V1 too short. The heel collar looks to be less padded. The outsole design, which I’ve read great things about, looks to be unchanged. In all, this looks to be a step in the right direction, and I’m sure I’ll be seeing a lot more of these out on the trails this year. I’ve been doing most of my recent snow hikes in a pair of the La Sportiva Crossover GTX 2.0, and have nothing but great things to say about them. La Sportiva has a new shoe coming out called the Mutant that is built on the same last, midsole, and outsole. It looks like the only difference will be with the upper. The thing I like most about the Crossover is the super sticky outsole. The lugs work great in all conditions, and I’ve been able to fly over any combination of trail surfaces I’ve come across. The midsole is responsive and very stable, which is a combination I love. For the Mutant, it looks like La Sportiva developed a new spiral tongue technology, which is probably a response to the popularity of Endo-fit by Salomon. I really like the look of the lacing system, as it looks very customizable and comfortable for long days on the trail. The Mutant looks very promising! I’m a big fan of Salomon and Brooks shoes. I’ve used the Cascadias for years for running and have a pair of waterproof Salomons which work out great for hiking in the muddy New Jersey Pine Barrens. I’m a big fan of Salomon and Brooks as well. The Cascadias are always solid! I used La Sportiva Wildcat (and still do) to hike across Spain. Loved them! I’ll check out the mutant when I need to buy my next pair- I don’t think I’ll ever hike in heavy boots again! I adored the Cascadias I had last year–except I felt the flexible midsole material squished out in too few miles, even though I had a light pack on. It’s been a beast trying to find a good replacement shoe as I think Salomon changed some of their lasts and the fit no longer works for me (bummer b/c I had one pair of there that lasted 2 years beyond a 700 mile trip)–Do you know anything about that? Trying out NB Leadville now & a pair of Pearl Izumis. Thanks for the write up. I’ve had that problem with a few shoes. I’ve found Salomon and La Sportiva to be the only shoes I can get 400-500 miles out of. Salomon definitely changed the lasts on their shoes. I really liked the shape of the Crossmax a few years ago, but they’ve really tapered the toebox and narrowed the midfoot in many of the models I’ve tried since then. I’ve had two pair of the XA Pro 3D, I just wish the toe box was a little more wide and forgiving like Altra and Inov-8. Let me know how you like the NB Leadville! Which PI are you using? I have a pair of the M2 and like them a lot. I was planning on picking up a pair of La Sportiva Ultra Raptors this year, but the Mutants look promising. Do you know if Brooks has updated the outsoles of the Cascadias since 8? I bought Cascadia 8s last year and they’re miserable on wet rock. I love them otherwise. Both the Raptor and Mutant are great shoes. I’m on my second pair of Raptors and am really loving the Mutants. The Casadias have a new upper, the midsole is the same, and the outsole has a new tread pattern. I don’t think the compound is any different though. They shoe tends to be durable, but like you said, not the greatest on wet rock. To follow up, I just got back from a 4-day hike in the Emigrant Wilderness (just north of Yosemite) and got stuck in a blizzard with 18+ inches of snow. We were expecting thunderstorms, not snow, so all I had for traction were my Cascadias. We trekked 8 miles back toward the trailhead down granite faces, up mountain sides and across streams and the Cascadias held up great. I didn’t experience any slippage (even before the snow when the granite was wet from thunderstorms) and they drained quickly after the water crossings. Temps were in the mid 30s, I only had thick Smartwool socks on and I still have all 10 toes. There must be something about the northeast rocks that the Cascadia outsoles don’t like. Maybe lichen? That’s interesting to hear! Thanks for the follow up, I guess it’s the lichen! brooks cascadia got to #10 already. As someone relatively new to hiking, I’ve been using a pair of Salomon trail shoes I bought when I knew nothing about gear and they are pretty comfy. I’m planning to do the Juan de Fuca trail, as well as other progressively harder hikes than I’ve been doing, and felt that I needed a pair of sturdy hiking boots. I bought a pair, and liked the grip but they were heavy and gave me blisters even after several wears. I see above comments indicating that maybe hiking boots aren’t necessary? I’m curious as to your thoughts on this for someone who is relatively new to hiking. (I couldn’t find an email address for you so just posting here). Thanks! Opinions on this matter are varied, but more and more people are turning away from big boots for hiking. Some say each pound on your feet is like 5 on your back. I’m a firm believer in lightweight trail shoes without Gore-Tex. I’ve found Gore-Tex to get wet in downpours, or drench my feet from the inside out with sweat. For me, a well built, well ventilated trail shoe is all I need for hikes. For mountaineering and other alpine adventures, boots make a lot of sense, but I just haven’t seen a good reason to wear them on hikes. It really depends on your hiking conditions as well though, and where you plan to be exploring. Salomon makes a lot of really nice hiking shoes, as do Merrell and other companies. In the end, you have to go with what works for you, but my opinion is that hiking shoes and trail runners are far superior to boots. You may want to give the Salomon X Ultra a try. I’ve seen them a lot on the trails this year, and they’re a nice “in between” shoe that bridges the boot to trail shoe gap. Hope this helps! Okay, well I’ll be showing my very green hiking self here with you professional types, but here goes. I hike in a pair of Keen’s. The technical aspects of them include that they are blue. I have a terrible problem with pronation and have never been able to run in anything other than a Nike (the pronating fixing kind). I tried a Brooks once, but the seam across the toes dug into my foot. So, recommendations for a pronating green horn who loves hiking but knows nothing about hiking shoes. Will be hiking Mt. Meeker near the front range of Colorado later this summer so am in preparation. after having a bad experience on the Camino with what I thought were good hiking shoes,upon my return home I purchased Keen Newport H2. Aside from the fact that I have to stop every now and then to empty road dust, I love them. I plan to do the TCT in November in my Keen’s. Any feedback is appreciated. Good to go? or should I invest in another pair of closed up, BETTER, hiking shoes? Wow, I’ve seen a few people hike in open shoes before, and if it works for you, you could try some harder hikes with a pack and see if they hold up. The TCT isn’t a technical trail at all, mostly fire road and smooth single track. If you don’t mind emptying dust and debris out, you could probably give it a go. I think your pack weight and conditioning will be a major factor. I’m not sure how the Newports will hold up when you have some extra weight on your back. I’d recommend finding a nice trail running shoe, as I found them to be optimal on the TCT, and just about any other trek or long walk. If you can make it to a running store or outdoor retailer, you can try on a few pair and see what works best for your feet. That would be my top recommendation, but if you really like your Newports, you could give it a try. Again, I think my main concern there would be protection, stability, and durability once you starting hiking with a pack. I’ve been looking for lightweight footwear with adequate ankle support for mountain disc golf courses. Any recommendations? Theresa, I don’t wear shoes with ankle support, so I don’t have any recommendations for footwear. I like to have my ankles utilize their full range of motion.